The current election cycle for the Governship of the major cities of the realm draws near its conclusion as today is the final day to cast your votes. 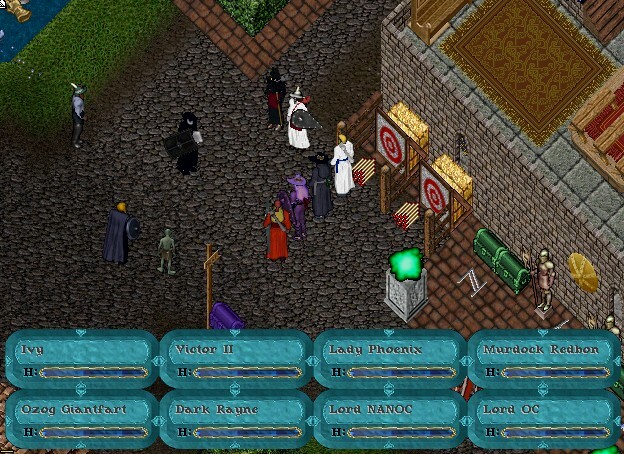 The week long event takes place at each cities respective stone located near it’s main vault. Votes will be tallied at sun up tommorrow and winners declared. Citizens need be respected in thier cities in order to vote. Donation of materials is seemingly the popular method of garnering such title. With the closing of the election period Governors will preside over thier respective cities for the coming months. With time running short and pride on the line these elections will surely go down to the wire. Reports come as eyewitnesses claim votes are purchased and corruption thrives as citizens of far away lands are aplenty skewing the voting process tipping the scales in the favor of those whose vote they have pledged. The game of thrones is indeed underway here on Chesapeake! Comments Off on Governors Election Near Complete! 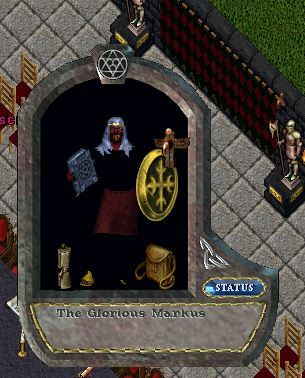 I found Governor Markus in Skara Brae just as he was donating $2,000,000 to help the other city treasuries. Though he was busy, I was able to interview him. “My first question is, what city are you governor of and what makes it unique? “I am the governor of New Magincia. 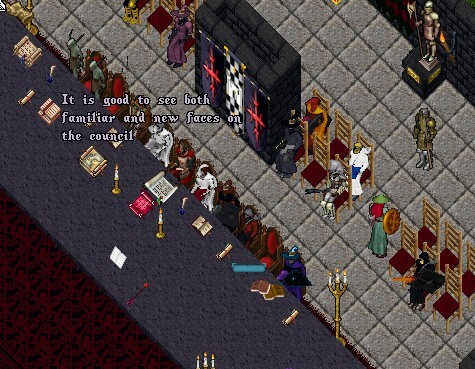 What makes my city unique is the presence of a vendor bazar. “Since I am a merchant, the fact that New Magincia is a city of commerce, it makes it a perfect fit. I own a well stocked pet vendor. 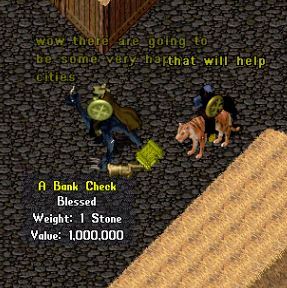 I enjoy providing needed pets to the citizens of Britannia.” he told me with pride. “Now for some more personal questions. I promise none of them will be embarrassing.” I said with a wink. ” I am one of the older settlers as I arrived in these land 16 years ago. I think my first home was in Skara Brae. Being so old it is hard to remember that far back.” he said with a smile. “I live in these lands because I enjoy having so many things to do. If you get bored of one activity, there are more that you can do. Community is important. Here you can find support to develop and grow. 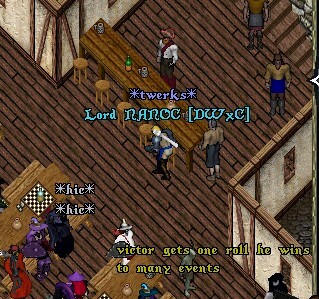 You can build a guild with friends and towns or cities with them. Anyways, I took the office of Governor to try to help and give back to the community. To give assistance to new and returning citizens and to communicate with other concerned people who would like to see our lands grow. To develop opportunities to attract more people to migrate to our lands. ” He explained. “Now I must return to my duties. “Governor Markus, thank you so much for your time to share with the citizens of New Magincia and Britannia.” I said as I bowed. “Be safe in your travels. Returning my bow, Governor Markus recalled away. 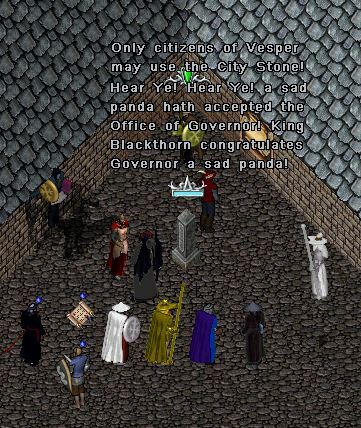 At this time Britain, Vesper, and Yew are still in need for governors. Present your request at the next town council. Coming soon interviews with each governor. Reminder that it is election time. 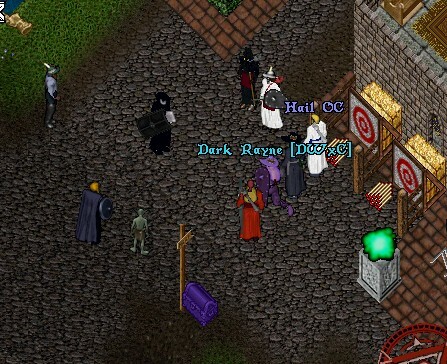 Starting June 1st, you will be able to go to the town stones and nominate yourself. To do this click on the stone to get the election menu, write in your name and confirm your nomination. After that you need to find a citizen to second your nomination. Last step is the actual election. All cities are now considered open. What does a governor do: the main job of the governor is to set trade deals. 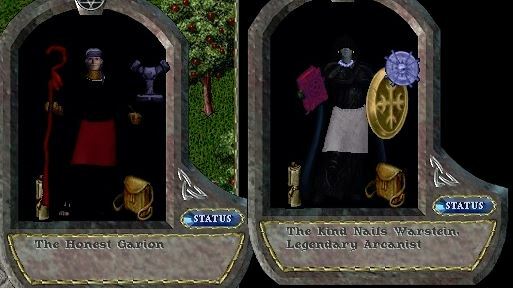 As these as expensive (2 mil. 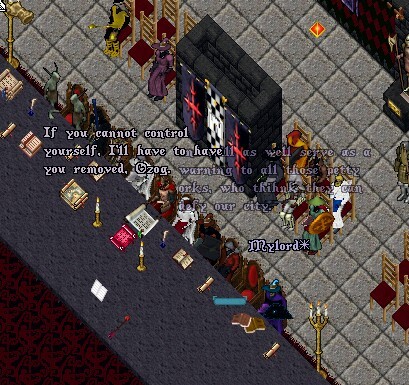 for 1 week), all banners and titles bought will now go to the city treasury. You can donate to the city of your choice even if you are not a citizen. Give the Herald the money. They are trust worthy. Governors can also grant titles and hold events. How long is my term as Governor: The terms are now 180 days (6 months). This is to allow Governors more time to develop events to fund the treasury and for fun. Impatiently King Blackthorn looked again at the long list of Cities without Governors. For too long the cities of Moonglow, Skara Brae, Trinsic, Yesper and Yew had been without leadership. 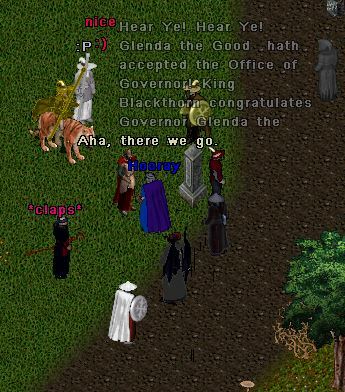 Considering the advise of Governors Nails Warstein of Britian and Garion of Jhelom , he decided a meeting of the council was in order. As the King’s bard, I was sent to fair Luna. “Hear ye, Hear ye, by order of the King, all citizens who desire a governorship are to appear at Saturday’s Council meeting. The news was greeted with cheers. For to long the cities have been without leadership. Four members of the crowd, were pushed forward. These are our new governors the crowd shouted. The four looked about, nervously, humbled by the cheers and support of the crowd. Is this your wish, I asked citizens; Grea, Rasersar Wej, Sad Panda and Veronica Mars. ” Aye” the four said together. Then by request of the king, present your petitions at the council meeting. All who have recommendations are also to appear. Quickly I hurried to tell the King the good news. Laughing, he said, “I knew with a bit of prodding worthy candidates would be nominated. “Before I hear your petitions, I need to know which cities are without leadership.” He turned to Rowan, his scribe, to ask for the information. Each of the candidate’s gave reason why they should be a governor. 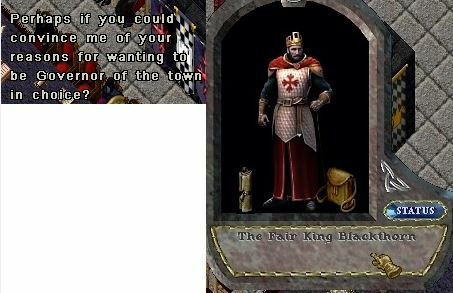 One after another they swore fealty to their chosen city, to serve both the people and the King. Upon listening to each, the King consulted with the current governors. Turning back to the candidates, “I have made my decision. I accept your request to become governors of your cities.” Before the council a gate appeared. One after another the council and candidates entered. 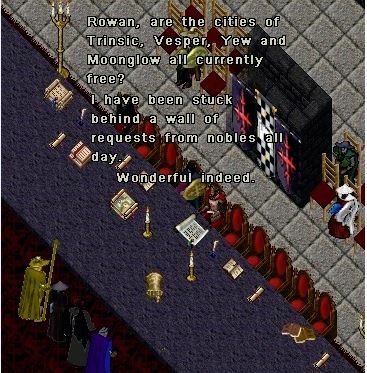 We arrived at the fair city of Moonglow first. 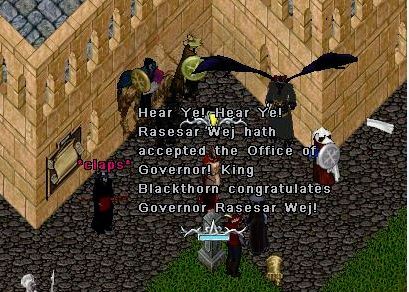 There the city’s mages welcomed and accepted Rasesar Wej as their Governor. From there the gate took us to Skara Brae. 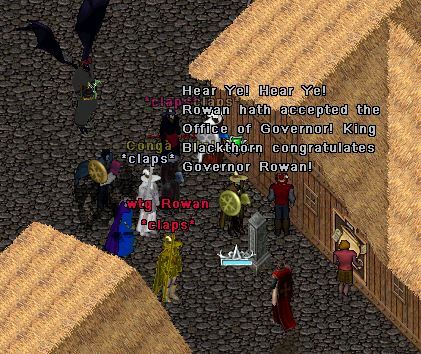 Having previously served as governor, Rowan was warmly welcomed back by the rangers. 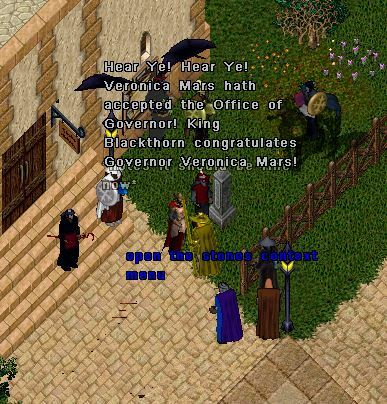 At the city of Trinsic, whose citizens had recently suffered many battles, Veronica Mars was warmly welcomed. At last order would be restored. The city of islands, Vesper, was the next stop. Sad Panda sighed with pleasure to be home again surrounded by the peaceful waters. Last to the abbey of Yew. The quiet monks nodded knowingly as they accepted Grea to be their governor. She assured them that both humans and elves would be treated fairly. That evening by the fire, I played a song about fair cities and the deeds of their citizens and governors. The King seemed to be drifting off into sleep. Speaking quietly as if to his self, at last the land has a chance for peace. But what of our two cities still left. Will Minoc and New Magincia also find a governor among their citizens. Suddenly he frowned, why did he have a feeling of dread? Governors are human, with failings. What will the future hold?